The Panasonic EX750 sits at the top of Panasonic’s outgoing line of 4K UHD LED LCD TVs. With five models in the range, there are screen sizes here for everyone, but perhaps this 58-inch iteration is the most interesting. For those that balk at a 65-inch screen, but want something more imposing than a cookie cutter 55-incher, it fits the bill. Certainly in terms of spec and finish, this 58-inch EX750 is a cut above similarly priced mid-range rivals. The set has '4K Pro' status, which in Panasonic parlance means it has been colour tuned in partnership with Hollywood creatives. 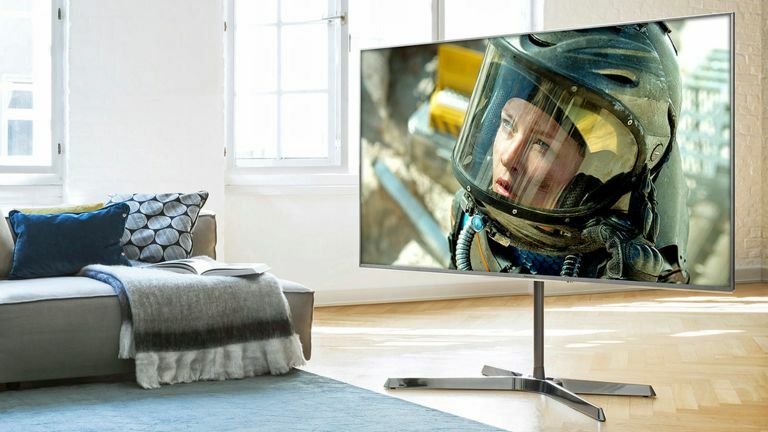 The look may be minimalist, with a slim bezel and chrome trim, but this TV is surprisingly substantial, thanks to the heavy, swivelling, height-adjustable stand. Connections include four HDMI inputs, all HDCP 2.2 enabled, and three USBs, plus component AV phonos. There’s also an optical audio output. Ethernet supports Wi-Fi. The IR remote control features a dedicated Netflix button, alongside Home and TV Guide shortcuts. The tuner choice is Freeview Play or two Freesat satellite. Audio is handled by down-firing speakers. As well as the Panasonic TX-58EX750 reviewed here, you can also get larger and smaller versions of the EX750. There's the Panasonic TX-50EX750 for your bedroom and the Panasonic TX-65EX750 for the larger lounge. Perhaps the main reason to buy the EX750 is as a gaming TV. It transpires the EX750 is a superb choice if you want a big, bright UHD gaming, thanks to an extremely useful Game mode. Without Game mode engaged, input lag is unimpressive at 102.4ms, but switch it on and the set drops to a mere 14.1ms. The inherent lack of realism in gaming graphics also means that quibbles over the EX750's odd colour performance become moot. Otherwise, picture quality on the high-transmittance Super Bright Panel is high, but those who don't like to tinker with settings should approach with caution. While Panasonic’s general UI is clean and intuitive, the picture processing options really are overly complicated, and if you alter one setting too many, its entire image performance can become degraded. For example, motion handling is excellent, making this a great choice for sports viewing. Our recommendation is the Clear Motion setting, with Intelligent Frame Creation on Min. Beware Clear Motion though, as this darkens the image, which has a ruinous effect on the set’s HDR performance. The set’s main image presets comprise Dynamic, Normal, Cinema, True Cinema and Custom. For everyday viewing, opt for the Standard preset. 4K resolution is crisp and accurate, but subjective fine detail can be lost if you view on the less contrasty Cinema or True Cinema image modes; they lack the impact of Normal and Dynamic. This isn’t a particularly bright HDR performer. At best, I measured peak brightness at just over 430 cd/m2 (aka nits) with a 10 per cent peak white window. Put in context, this is better than the Hisense U7A, but that model is cheaper and has a better black level performance, so overall dynamics are comparable. Panasonic’s Enhanced Local Dimming technology adds welcome snap but tends to crush near black detail. Still, for most content, it produces a well balanced, impactful image. This is also one of the few big 4K TVs still available which supports 3D, although you’ll need to buy compatible Panasonic Active Shutter glasses, as there are none provided. As usual with Panasonic, the EX750 comes well equipped. The set uses Panasonic’s My Home Screen V2.0, which is a powerful but uncluttered connected OS that includes some friendly functionality, including folders for multiple users and an upgraded Media Player that supports 4K HDR10 and HLG content playback. In addition to all the mainstream catch-up TV services (BBC iPlayer, All4, Demand 5, ITVhub), there’s Netflix, which streams in 4K and HDR, and Amazon Video and YouTube in 4K. Other distractions include Rakuten.tv and BBC News & Sport. Now widely available at £200 off the list price, I reckon many buyers will be prepared to forgive this set its few foibles. When it comes to design, it looks distinctly premium, and the smart user experience, courtesy of My Home Screen v2.0, is first rate. Viewed on its Standard or Dynamic settings, the screen isn’t short of eye-candy appeal either. The TX-58EX750 combines a dapper design, with excellent UHD detail and vibrant colour performance. Stray off the default/Auto image path though and things become overly complicated. Very much on the plus side, the EX750’s motion handling is great, which makes it a cracking choice for the upcoming FIFA World Cup, and its gaming performance is phenomenal, making this a superb 4K screen to partner with a PS4 Pro or XBox One X.